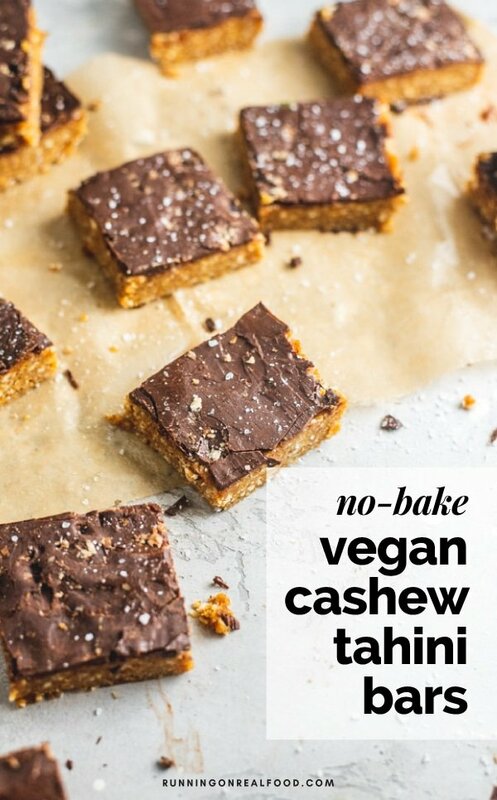 These delicious No-Bake Cashew Tahini Bars come straight from vegan dessert heaven but are still suitable for a healthy snack. 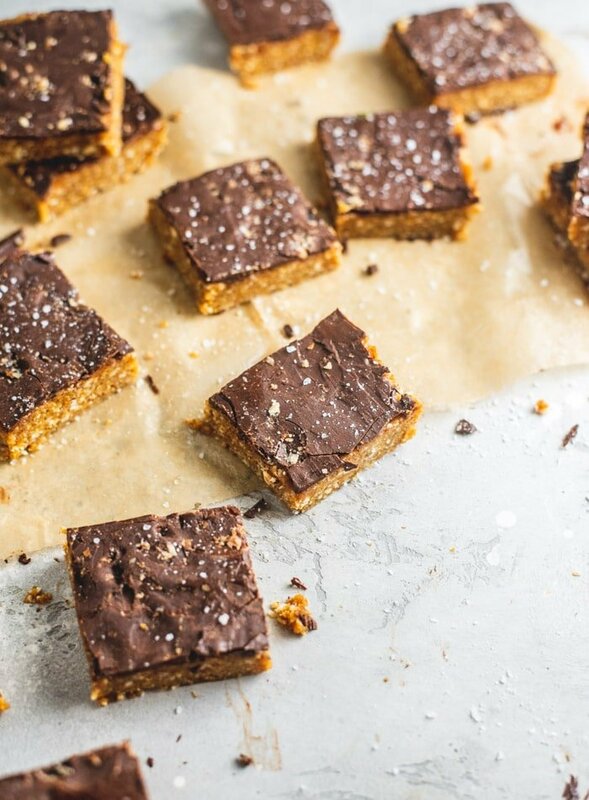 All you need to make them are cashews, dates, tahini, sea salt and dairy-free chocolate. 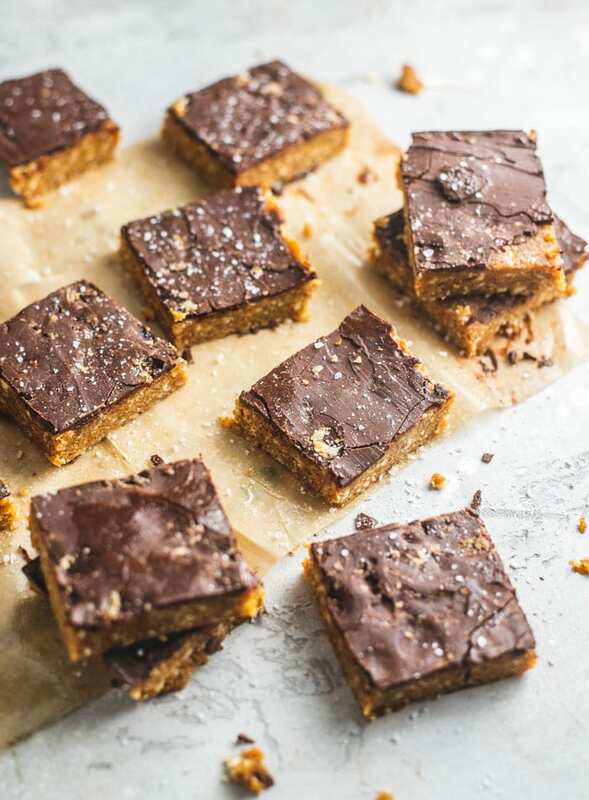 You really only need 3 ingredients to make these since the chocolate topping and sea salt is optional however I’d recommend at least adding the chocolate topping because hello, it’s chocolate! Tahini. You’ll need a nice, smooth, creamy tahini. My favourite brand in Canada is Arz Fine Foods. It’s ultra-smooth, has the best subtly sweet flavour and works wonderfully in recipes. When shopping for tahini, watch that the only ingredient listed is sesame seeds. There should be no added oil or sugar. Raw Cashews. Look for cashews with just one ingredient: cashews. There should be no added oil, salt or sugar however in a pinch you could definitely use dry-roasted salted or unsalted cashews in which case the ingredients may list salt. Dates. 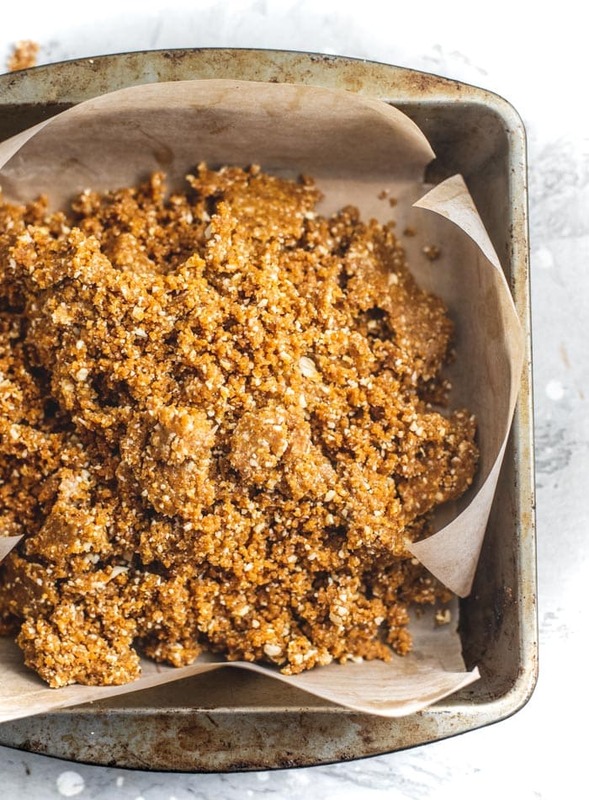 Soft, fresh dates are key for no-bake recipes like this one. I used pitted sayer dates, which are small and sweet and have a rich, caramel flavour. Medjool dates are also wonderful. Deglect noor or honey would also work in fact, any kind of date will work as long as they’re soft and moist so they can bind the recipe. If you only have hard, dry dates, place them in a bowl, pour boiling water over them, let them sit for 15 minutes and then drain well before using. Dairy-Free Chocolate. If you want to add the chocolate topping – which is recommend, of course! – look for a good quality dairy-free dark chocolate or dairy-free chocolate chips. I like Alter Eco, Green & Blacks and Enjoy Life Chocolate Chips and Chocolate Morsels. Alternatively, make your own raw vegan chocolate to use for the topping. Sea Salt. The sea salt topping is optional but I love how it enhances the flavour of the bars. I used a little salt both in the bars and on top. Here are the various kitchen tools I used to make this recipe. Food processor. I use my food processor to make recipes like this. It works best for breaking down the nuts and creating the nice, thick dough. Baking pan.My pan is about 7 x 7 inches but an 8×8 is fine. 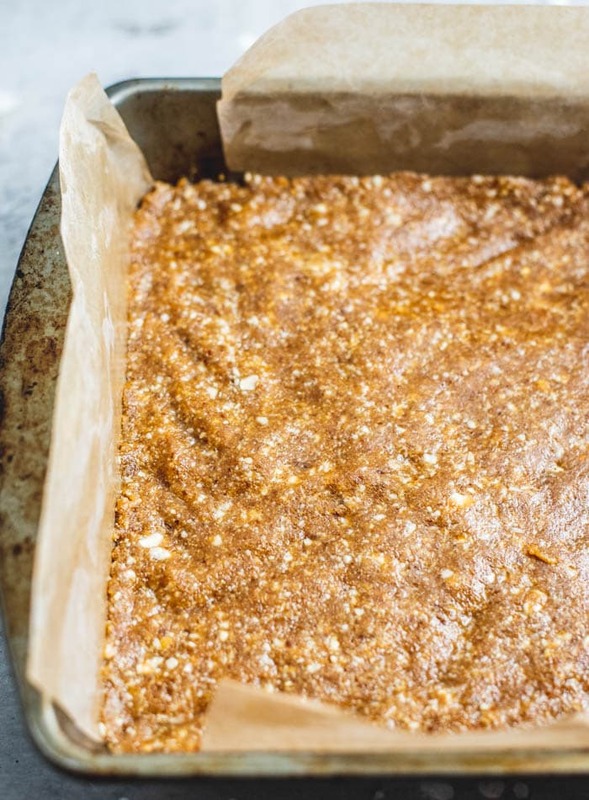 You could also use a loaf pan for extra thick bars. Parchment paper. Use parchment paper to line the baking pan so you can easily lift the bars out once they’re set. I cut two strips of parchment paper, longer but thinner than the pan (if that makes sense? ), then you can lay them over top of each other with the long ends sticking out for easy removal. You can use saran wrap if you prefer but I wouldn’t recommend wax paper as it tends to stick to the bars. Kitchen scale and/or measuring cups. I use a kitchen scale for all my recipes. 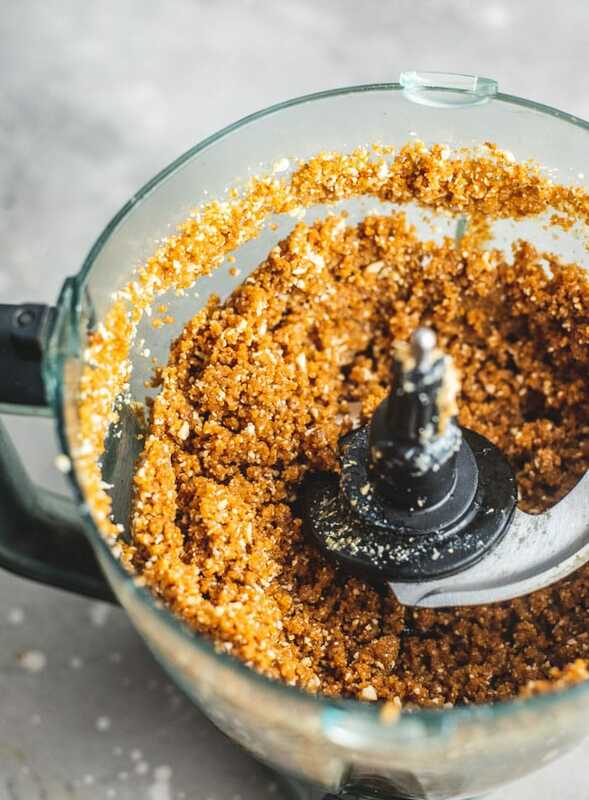 They’re inexpensive, more accurate than measuring cups and make for quick and easy work since you can just add the ingredients right into the food processor placed on the scale. In addition, you’ll need a bowl to melt the chocolate, a knife to cut the bars and a container for storing. To melt the chocolate, I placed a glass mixing bowl over a pot of boiling water to create a double boiler. You can melt it in the microwave if you prefer or like I mentioned, make your own chocolate using this recipe. 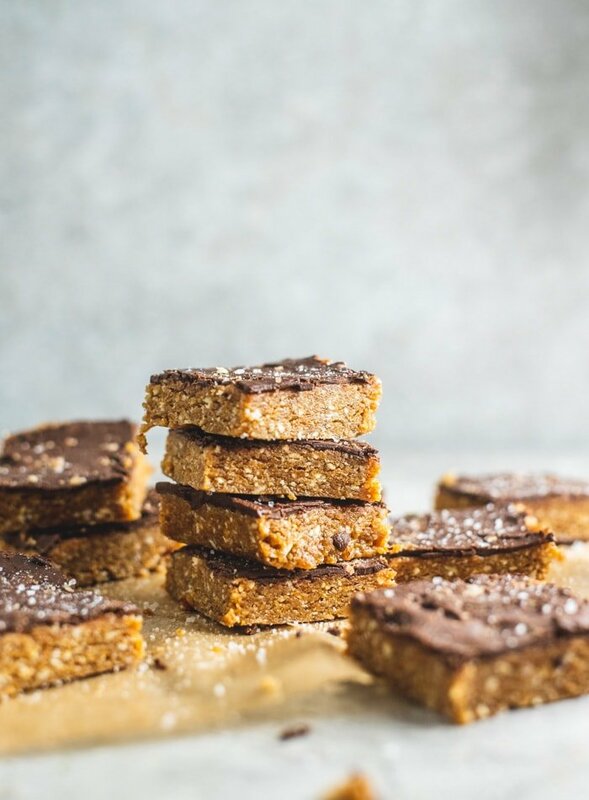 These simple but decadent bars can be made as a 3-ingredient healthy snack, either rolled into energy balls or pressed into bars, or with the added chocolate and sea salt topping, as a delicious vegan dessert. They’ll keep in the fridge for a week or two but I’d recommend storing them in the freezer, they’ll keep up to 3 months in a sealed container (or longer but I doubt they’d last that long!). 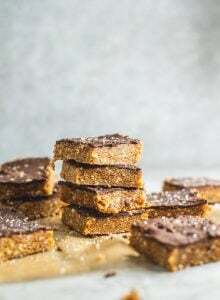 These simple, no-bake bars are a breeze to make and are totally suitable for snacking but still delicious enough for dessert. Add the cashews to a food processor and pulse until mostly broken down. Add the dates and tahini and mix until it forms a big clump of thick dough. Line a square baking pan (mine was 7 x 7 inch) with 2 overlapping strips of parchment or wax paper. Press the dough into the pan, taking a few minutes to firmly press it down and smooth it out. In a microwave-safe bowl, bowl placed over a pot of boiling water or double boiler, melt the chocolate until smooth and creamy. 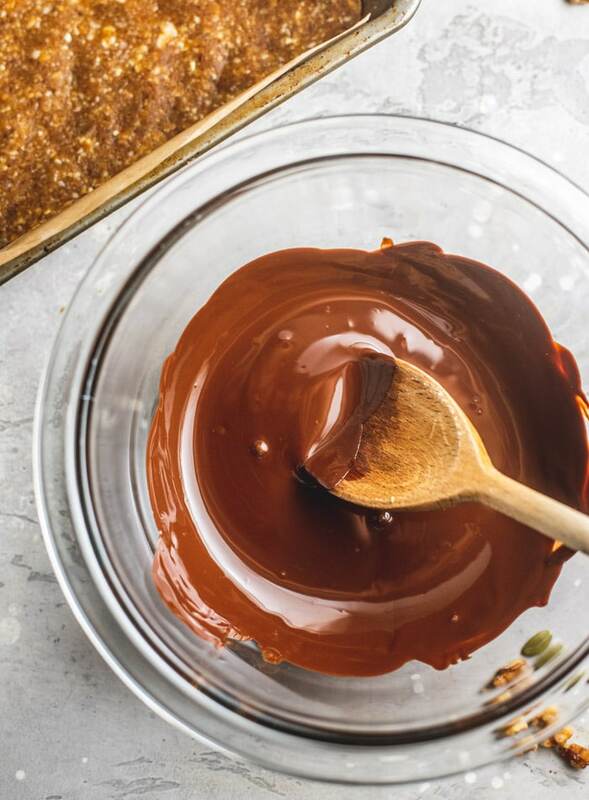 Use a spatula to evenly spread the chocolate over the bars. Sprinkle with sea salt. Place in the freezer for 2 hours to set then lift out of the pan and cut into 16 squares (or 8 large bars if you prefer). Feel free to double the amount of chocolate used for a thicker chocolate topping. If you prefer, use my recipe for raw vegan chocolate to make the chocolate coating. Is there any chance of using stevia or something for a less caloric version? Not for this one unfortunately as the dates are the base of the recipe but you could omit the chocolate to reduce the calories a bit. Wow! This recipe is so good! Thank you so much!! You’re so welcome!! So glad you enjoyed it.